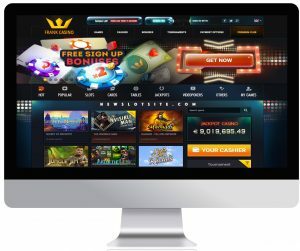 A new slot site has been launched on the UK market. It is the fresh and cool challenger Frank Casino that has opened up their gates for UK customers making their site look good with a wide selection of slots and a great casino bonus to claim. At Frank Casino, it is possible to see how much of the bonus which is wagered and also deposits new money without leaving the site. Very impressive Frank! 》100 free spins on your first deposit if depositing £25 or 100% deposit bonus up to £200 on your first deposit. After claiming the welcome offer, the choice is up to you. Pick the campaigns you want to claim and choose between cash backs, happy hours, daily tournaments and deposit bonuses. Also, you will be able to collect points called Franks, which then can be traded towards cash, free spins or bonuses. The wager requirement is set to 35 times the money, which can be considered as relatively low compared to other casinos. With such a wager requirement, about 50% of the bonus value will be converted into real cash. At Frank Casino, you will most likely find your favorite games but will also be able to find new favorite slots. Frank offers the most popular slots form NetEnt such as Gonzo’s Quest and Starburst, including the super jackpot games from Microgaming such as Mega Moolah. In similarity to other new UK slot sites launched during 2016, clever and user-friendly functions are in place. When playing you should get used to collecting Franks which is the casino’s own virtual currency you can trade towards different goodies such as free spins and deposit bonuses. All you need to do is play the slots, where the more you play will get you the more Franks. The number of Franks you have will also increase your VIP-status in the casino where you by getting VIP-status will be given the opportunity to participate in exclusive VIP campaigns. After you have done your first deposit, you will be rewarded with 20 Franks so you can get used to the system. Frank Casino is available for both mobile phones and tablets. The casino supports all common operating systems, so it does not matter whether you use an iPhone, Windows Phone, Android or any type of tablet. When using such devices, the selection of games gets a bit limited, as some slot machines do not support that type of interface. However, game providers have developed their most played slots also for mobile, so hopefully, you will be able to find your favorite slots also when using your phone to play.Customer support at Frank Casino. If you need support or have any questions when playing at Frank Casino you can always contact the team using the email support@frankcasnio.com If you want faster service, it is recommended to use the live chat, which is available 24 hours per day. Frank Casino offers free transactions both for deposits and withdrawals, and they are really fast completing the transactions where the majority is managed within seconds. Observe however that the payment provider might charge a fee for making the transaction. If you experience such fees and have questions, it is recommended that you contact the support for your particular payment provider. Frank Casino supports the most common payment methods in the UK offering Skrill, Netteller, Paysafecard, Visa and MasterCard amongst others. In general, casinos with low wager requirements tend to be honest and easy to understand. Frank Casino is such a casino that except offering an impressive welcome offer has its own currency Franks that you trade to whatever you prefer. Sometimes the graphics can feel a bit messy with a lot of colors and offers at the same time, very similar to casinos in Las Vegas. The reason for that is simply that Frank Casino has a lot to offer and wants to be perceived a happy and playful casino. Overall recommendation is to try this newcomer, not only for the big welcome bonus but also because of the playful currency Franks.